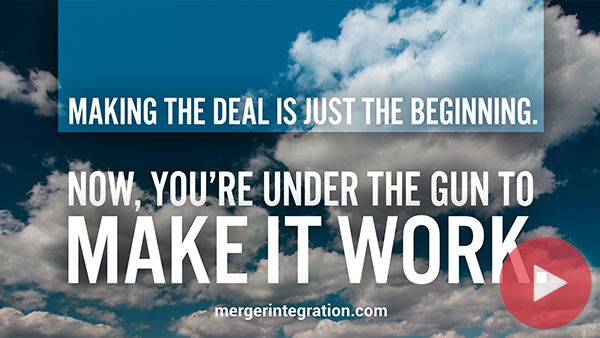 M&A communication planning is difficult because a merger is always a fast-breaking story. Every day brings new developments. The truth is a moving target, and often dead on arrival. Rumors start to fly as soon as people pick up the scent that a merger is in the works. This is high drama. Hot stuff. Everybody has an opinion, and all the rules of gossip prevail. In this tense environment, it is easy for messages to be misinterpreted, twisted, or exaggerated. Communication planning requires much more thought in a merger than it does during more stable, less stressful circumstances. Yet, most key managers receive little education on what to say, and just as importantly, what not to say. There is little opportunity for them to make an insignificant remark. Practically everything they communicate is taken seriously, studied for innuendo, or held up to the light for subtle implications. Just because a comment from an executive is well-intentioned doesn’t mean that it is effective. When merger difficulties develop, 75 percent of them have their roots in communication problems. In fact, at the very time company communication needs to be better than ever, it’s often at its worst. And the trouble is that communication problems never seem to remain just communication problems. They end up causing productivity and morale declines and—eventually—profitability problems. Work becomes more frustrating and stressful for everyone. A well-crafted communication plan can help reduce employee anxiety and cynicism, protect the acquirer's credibility, and prevent top management from being accused of reneging on its promises. In this section, we list the questions to expect from different constituencies and the proper information to convey to each. We also provide playbooks, agendas, and guidelines for conducting announcement, day one, and benefit meetings. Plus, our presentations and articles (more than twenty) explain M&A communication planning best practices. And our eMerger software offers step-by-step instruction on how to develop an integration communication plan. Internal and external communication blunders. Common inquiries from employees, customers, vendors, the community, and the media. Just because a comment is well-intentioned doesn't mean that it works. Example of executive email to troops 90 days after close. Managers typically underestimate the communication effort required. An integration initially produces more problems than solutions. This is the “it gets worse before it gets better” phenomenon. And it’s totally predictable. Easily customized Word document that includes answers to FAQs, sample letters to customers, and critical talking points and messages. Guidance for customer-facing employees and teams to help them communicate effectively with their customers about the acquisition. Includes communication tips, talking points, letter and answers to FAQs. Includes communication tips, talking points, letter, and answers to 45 FAQs. Makes the job of sharing accurate, timely, consistent information with employees easier. Sixteen page document that includes answers to seventy-five employee FAQs, plus communication guidelines, and important talking points and messages. Before and after plans are finalized. Agendas and guidelines for conducting announcement, day one, and benefit meetings. Communication problems never remain just communication problems. Employees weigh losses twice as heavily as gains. Come across as a real leader, not a breezy politician. They will probably appreciate the special attention. What employees are dying to hear. People operate with less intensity when priorities are fuzzy. Why Do "Staggered Experiences" Foul up M&A Communications? Why Set Up Rolling FAQs? Who Should Communicate Key Messages During an Integration? The 5-page example provides answers to more than 30 frequently asked questions from employees in a merger. The 4-page example of a merger core message document serves as content for various M&A announcements and helps ensure consistent communications throughout the organizations. The Core Message Word template is also provided. A useful, simple one-page checklist to plan your messages. Spreadsheet identifies key elements of communication plan including stakeholders, key messages, timing, priority, and concerns. Spreadsheet that categorizes stakeholders and includes columns for stakeholder concerns, ability to influence, change impact, activities, timing, ownership, and resource requirements. Covers all the tasks acquirers should follow to ensure all constituencies are well informed. An owner, due date, and priority are assigned to each task. Includes answers to FAQs, sample letters to suppliers, and important talking points and messages. Covers media plan, talking points, letter to state and local officials, and posts for social and media websites. Communication guidance for supplier-facing teams that includes key messages, talking points, sample supplier letter, and supplier FAQs with answers. Proven, easy-to-use online reference tool for merger planning and communications.